Roman emperor, the first of the long succession of distinguished men from the Illyrian provinces, was born at Budalia near Sirmium in lower Pannonia in AD 201. About 245 the emperor Philip the Arab entrusted him with an important command on the Danube, and in 249 (or end of 248), having been sent to put down a revolt of the troops in Moesia and Pannonia, he was forced to assume the imperial dignity. He still protested his loyalty to Philip, but the latter advanced against him and was slain near Verona. During his brief reign Decius was engaged in important operations against the Goths, who crossed the Danube and overran the districts of Moesia and Thrace. The details are obscure, and there is considerable doubt as to the part taken in the campaign by Decius and his son (of the same name) respectively. The Goths were surprised by the emperor while besieging Nicopolis on the Danube; at his approach they crossed the Balkans, and attacked Philippopolis. Decius followed them, but a severe defeat near Beroë made it impossible to save Philippopolis, which fell into the hands of the Goths, who treated the conquered with frightful cruelty. Its commander, Priscus, declared himself emperor under Gothic protection. The siege of Philippopolis had so exhausted the numbers and resources of the Goths, that they offered to surrender their booty and prisoners on condition of being allowed to retire unmolested. But Decius, who had succeeded in surrounding them and hoped to cut off their retreat, refused to entertain their proposals. The final engagement, in which the Goths fought with the courage of despair, took place on swampy ground in the Dobrudja near Abritum (Abrittus) or Forum Trebonii and ended in the defeat and death of Decius and his son. Decius was an excellent soldier, a man of amiable disposition, and a capable administrator, worthy of being classed with the best Romans of the ancient type. The chief blot on his reign was the systematic and authorized persecution of the Christians, which had for its object the restoration of the religion and institutions of ancient Rome. 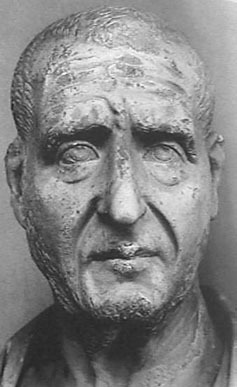 Either as a concession to the senate, or perhaps with the idea of improving public morality, Decius endeavored to revive the separate office and authority of the censor. The choice was left to the senate, who unanimously selected Valerian (afterwards emperor). But Valerian, well aware of the dangers and difficulties attaching to the office at such a time, declined the responsibility. The invasion of the Goths and the death of Decius put an end to the abortive attempt.